The world markets groaned as the burden of the rising American debt and the European deficit weighed down more productive countries. European authorities sought to avert a Greek default on their watch without promising to engage the same heroics for Italy. And in the United States, politicians kicked the can down the road, blaming everything except excessive spending. Global investors experienced negative returns as European markets pulled the MSCI EAFE index down 12.14% for the year. MSCI emerging markets were down 18.42% for the year, having been up 18.88% the year before. In fact, 37 of 45 markets tracked by MSCI were negative. The United States seemed well only by comparison. The U.S. S&P 500 managed a total return gain of 2.11% for the year, positive only by counting the reinvestment of dividends. But the markets being relatively flat over the year did not mean individual stocks were well behaved. Compare the three best performing stocks in the Dow 30: McDonald’s (34.0%), Pfizer (28.6%) and IBM (27.3%) against the three with the most significant losses: Hewlett-Packard (−37.8%), Alcoa (−43.0%) and Bank of America (−58.0%). Over the year large cap did better than small, and growth stock did better than value. 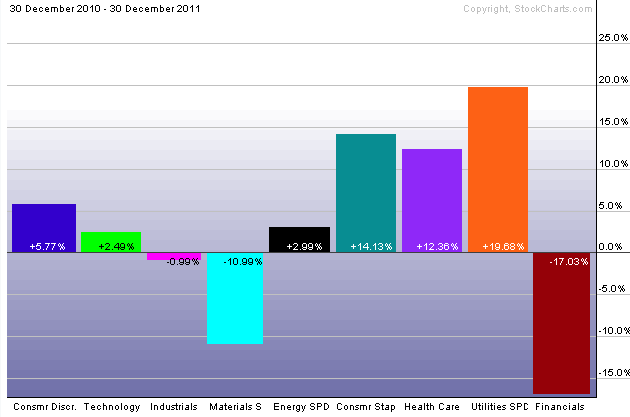 Among sectors of the economy, the defensive sectors of utilities, consumer staples and health care did the best. Most of these trends were set by the drop during the summer months. The markets bottomed out on October 3 as many investors gave up hope. At that point the S&P 500 was 1099, and the Dow was 10,655. These are good numbers to memorize. Usually our minds fixate on the high-water marks of our investments, causing us to notice our losses to a much greater extent than our gains. Remembering these numbers at the bottom of the market helps us focus on the fact that the volatility going forward has stayed above these numbers. This helps us not to panic. It helps us to stay invested. It helps us to do the right thing. The next 19 trading days saw the Dow rise 1576 points to close at 12,231. The rally in October was significant, but returns in the fourth quarter only blunted the summer’s losses. 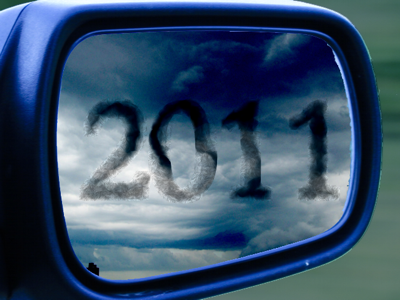 The year 2011 was a year of reversals, primarily because of third-quarter returns. This past summer many investment categories that normally do better over a long-term investment strategy did not. This situation is not unusual for a single quarter’s worth of time. Such a result only makes reversion to the mean much more likely in the coming quarters. But the fourth quarter’s return to historical trends will have to continue for several quarters to erase the upset of the summer months. One way of looking at 2011 is that in a year in which the S&P 500 had a total return of 2.11%, it also had a dividend yield of 2.07%. Even when share prices went nowhere, you still got a return better than money market interest yields. Money market is paying near zero, but other bond categories did better. One of the best performing categories was the Barclays US TIPS index that gained 13.56% amid inflation worries. The market is moved by worries such as these, not economics. It is only when economics moves investor sentiment that people buy or sell. And it is only buying and selling that moves the markets. The drop in the summer of 2011 was the result of $83 billion flowing out of stock funds during the summer months. The worries of the summer have been factored into market prices because those who would sell did sell. The total net flows over all of 2011 were $102 billion out of stock funds. It takes new worries and new investors selling to move the markets lower. As I’ve said many times, asset allocation means you always have something to complain about. But it also means you only have a partial complaint. Overweight what does better on average even if it fails to do so one quarter. Never let a brilliant long-term strategy be ruined by an emotional reaction to one quarter or even one year’s worth of returns. What Happened This Summer (2011)? What happened to the dollar this summer (2011)? Nice blog and information, im just out doing some research, keep up the great writing.